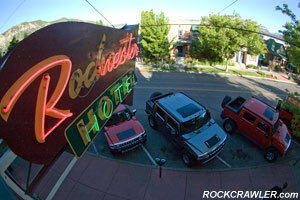 We arrived in gorgeous Durango, Colorado, eager to check out what HUMMER has in store for 2008 - namely the updated H2 and the new-for-2008 H3 Alpha. While the H2 is mostly a souped up refreshed model, most of us were mostly excited to check out the H3. 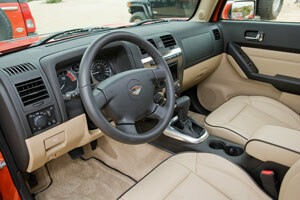 Read on to find out what's new for 2008 from HUMMER. I'll cut right to the chase. 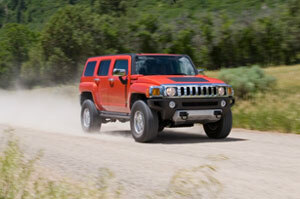 I love the 2008 HUMMER H3 Alpha. Whenever they want to furnish one for a project vehicle, I'm in, baby. OK, now that that's out of the way, on to the rest of the story! By now, you're probably familiar with the H3, which comes out of the same Louisiana plant as the Colorado and Canyon pickup trucks. While it has some roots entangled with these trucks, HUMMER insists that the H3 is a very very differnt beast and shares only about 10% of its parts with the pickups. Ah, the marvels of modern auto plant flexibility! When you ask anyone who's driven an H3 what they do not like about it, they usually bring up two things. First, the lack of power provided by the 3.7L I-5 engine (242 hp @ 5600 rpm and 242 lb-ft @ 4600 rpm) and second, it's hard to see out of. The 2008 H3 is still hard to see out of. The Brinks truck-like high beltline and windows make visibility difficult - especially on the trails. But it's also what gives it a really beefy, manly look, so it's a compromise we can live with. 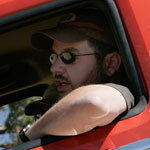 Sometimes looks over functionality do win - even for an off-roader. New for 2008 in the entire H3 lineup are standard head curtain side air bags, StabiliTrak, four-wheel antilock brakes with traction control, dual front air bags, tire pressure monitoring system, OnStar, vehicle-to-vehicle crash compatiblity and LATCH rear child seat anchors. 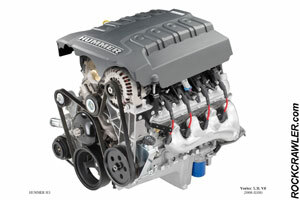 The inline five cylinder stays for 2008 and while it does amply move the 4,854 pounder around town, in typical HUMMER fashion, ample is about it. Driving the I-5 one definitely should consider the 5-speed manual transmission over the 4-speed Hydra-Matic 4L60 if they want to get out of their own way. That said, the I-5 is not a complete dog, it's just not for the power-hungry crowd. 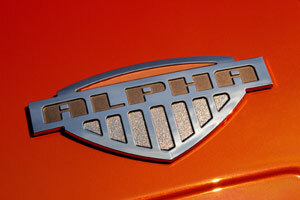 So what if we told you that HUMMER wanted to hand down the now-defunct H1's "Alpha" nameplate to the H3? Alpha was the hopped up version of the H1 before it got the axe in 2006. Well, we're telling you now. The H3 gets the optional Alpha treatment for 2008. While the Alphas are adorned with the "Luxury" equipment package, the Chrome Appearance pacakage, 16-inch chrome wheels, a 4.10 rear axle ratio and Alpha badging, the real blessing comes in the form of a 5.3L V-8 (same one as found in the 2007 Silverado pickups). This cast-aluminum small-block pumps out 295 hp at 5200 rpm and 317 lb.-ft. of torque at 4000 rpm. Now we're talkin'! Our first drive in the H3 Alpha would be from Durango, Colorado down to Aztec, New Mexico. We didn't get far from the Rochester Hotel before we confirmed that the Alpha is the cat's meow H3. Driving the winding roads down to Aztec, the H3 powered up the hills with aplomb and could definitely get out of its own way when it needed to. The H3 handled beautifully through the turns with little body roll and the Alpha seats kept our rear ends comfortably in place during more spirited driving. The H3 held its speed going up the hills very well, thanks to the extra power and lower gears. We arrived in Aztec, NM at an area with no signs or markings, whatsoever. Actually, we were about 12 miles outside of Aztec at an area along SR 173 known as The Rock Garden Trail. The trail is really more of a playground, with obstacles strewn throughout. This would prove be a great place to check out the H3, as well as the H2, later in the day. 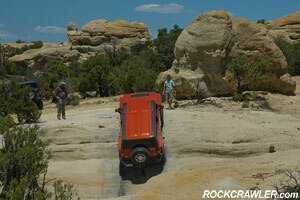 The ground is hard, sandy rock, much like that found in Moab, UT, so the HUMMERs enjoyed great traction out there, for sure. While we never really got to play with the traction systems in any slippery conditions, we did get to use them quite a bit on the rocks - and they did great! Even without engaging the rear locker, the H3 can still move itself through some pretty gnarly terrain, simply through selective automatic braking by the traction control systems. There really isn't much that can stop an H3 piloted by an experienced driver other than space, gravity, and simple physics. 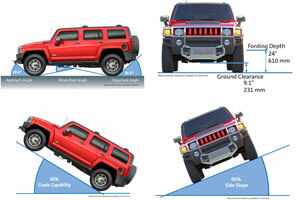 In other words, unless the obstacle is too tight, too steep or the rocks are just plain too tall, the H3 has a pretty darned good chance of making it over - and this was exactly what the HUMMER folks wanted to prove to us. 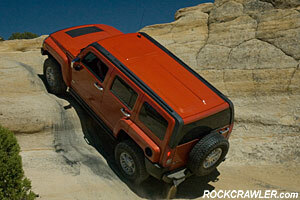 HUMMERs are known for operating while on extreme angles and this was a great place to experience that ourselves. We saw plenty of sky as we drove up super-steep obstacles and spent plenty of time off-camber, as well. All of this while enjoying air conditioning in the 110 degree direct sun. Ah, the luxury of it all. While the independent front suspension had us driving on three wheels at times, the rear axle has amazing flex which kept the solid axle on the ground while the traction systems, as well as the rear locker kept us moving forward. 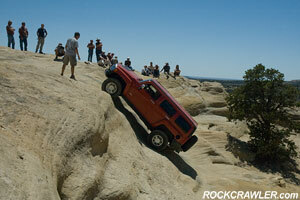 Technology has certainly made off-roading easier and getting stuck tougher. If it sounds like we're big fans of the H3, we really are. 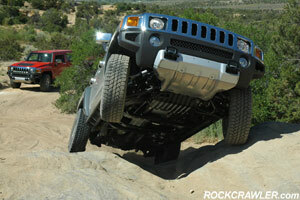 While there are certainly trails out there that they won't conquer, the H3 is a very well-rounded ute. 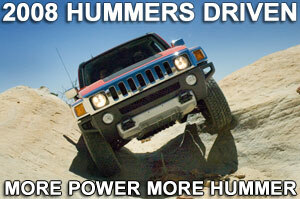 By packaging everything HUMMER into a smaller package, they have come up with an awesome vehicle with the H3. And now, fortified with the Alpha package, they have one heck of a hit on their hands. Plenty of room for the family and your stuff, a great off-road pedigree, and improved on-road performance comfort make the 2008 H3 Alpha one to definitely consider.